(SitNews) - Two things happened on top of the world this week. In Utqiagvik (formerly Barrow), on Jan. 22 the sun topped the horizon for the first time since mid-November. The day before that, Jan. 21, was the first time since Halloween the town’s thermometers recorded a below-normal daily average air temperature. The returning daylight for the continent’s farthest north community is due to a predictable nod of the Earth back toward the sun. Utqiagvik’s second day of direct sunlight, Jan. 23, featured almost an hour’s increase from the day before. The town will have four hours of daylight by the end of January. By May 11, there will be no night. 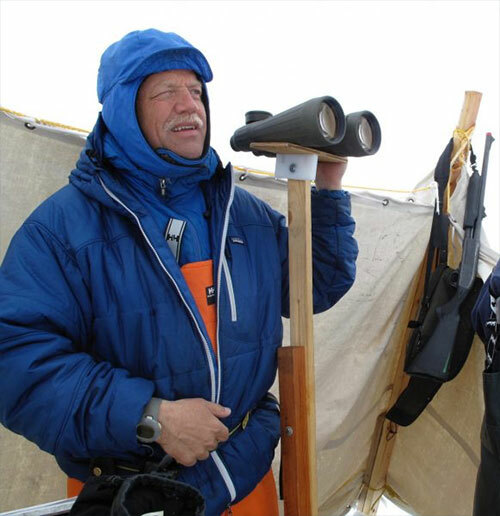 Craig George, a North Slope Borough biologist, looks for migrating bowhead whales north of Utqiagvik in May 2010. Just as dramatic are the recent warm autumns and winters in Utqiagvik. While many people worldwide sense their favorite places are changing, residents of Utqiagvik use the past tense. “The term is no longer ‘climate change’ at Utqiagvik. It is ‘climate changed.’ No doubt about it, based on my 40 years,” said biologist Craig George, who studies bowhead whales and other animals from his home in Utqiagvik. George remembered back to October 1988, when three gray whales became trapped in Beaufort Sea ice just north of Point Barrow. The whales became a worldwide news story, as local rescuers used chainsaws to cut circular breathing holes in the sea ice, trying to lead the whales to open ocean. In December, National Oceanic and Atmospheric Administration scientists looking for the latest temperatures from Utqiagvik sensors found computer algorithms had flagged and removed November readings because they seemed so far off. The average temperature for October through December 2017 was 15.6 degrees F, 12.2 degrees above normal and highest for that span in the last 98 years, according to NOAA climatologist Rick Thoman. Since 2000, the average October temperature in Utqiagvik has increased 7.8 degrees F. November’s average temperature has increased 6.9 degrees and December’s 4.7. Utqiagvik residents experienced above-normal average daily temperatures 77 percent of the year 2017, Thoman figured. It seems a different place. 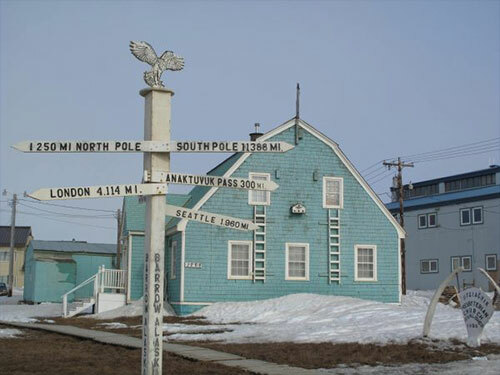 A signpost indicates geographic distances from Utqiagvik, formerly Barrow, where evidence of a warming climate has been dramatic this winter. “Barrow (Utqiagvik) presents a great example of a changed climate,” said climatologist John Walsh, chief scientist for the International Arctic Research Center at the University of Alaska Fairbanks. Utqiagvik also had its latest ground freeze-up ever this winter. “Permafrost temperatures there at (4-foot) depth are 3 to 4 degrees C higher than at the same time last year, even though last year was also warmer than normal,” said Vladimir Romanovsky of UAF’s Geophysical Institute. Sea ice that is forming later in the fall and covering less ocean is driving the warmth. Open ocean has a warming effect on the land around it. Utqiagvik is seeming more like Helsinki than a town on the Arctic Ocean. The Chukchi Sea to the west of Utqiagvik did not ice over until about Jan. 1, 2018, the latest in the satellite record that goes back to the late 1970s. An average date the Chukchi Basin was ice-covered in the late 1980s was about Nov. 20. Where does Utqiagvik go from here? Residents say they hoped for a return to conditions before the 1990s, when the extreme warming began. Since the late 1970s, the University of Alaska Fairbanks’ Geophysical Institute has provided this column as a public service in cooperation with the UAF research community.